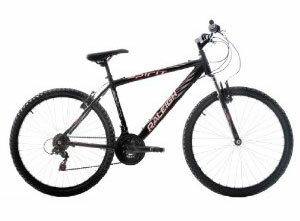 Raleigh Spirit Mens Mountain Bike, with its eighteen-inch computer-aided designed frame and fork ensures first-rate paint finish and sturdy materials. The bike is designed for kids 12 years and up. It’s quite difficult to rival the history and experience Raleigh has in terms of manufacturing and designing all types of bikes. Raleigh has it all: mountain, off-road bikes suitable for all ages. Raleigh even has bikes suited for small kids. With 120 years in the biking industry, Raleigh definitely carries a rich and well-founded legacy.